Le Club Accorhotels has a rate deal for stays at participating 74 Ibis hotels in Spain, Italy & Portugal between June 1 and August 31, 2014. These hotels are offering a flat rate of 45 euros ($59). This sale is open for all starting on May 6, but Le Club Accorhotels members can already book these discounted rates now. Note that this is a prepaid rate that doesn’t allow changes and/or cancellations. Only book it if your plans are FIRM. There still seems to be a problem with Le Club Accorhotels member number identification on some of these pages. If you get an error message that your number is invalid, just use the regular rate search here with your number and the discounted rates will be shown. The 45 euros membership rate was clearly the lowest for a midweek one night stay in June. I really wish Accor would fix this membership number identification issue on its website. It has been now going on for more than a week. 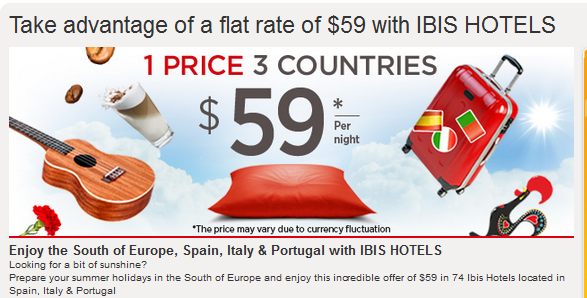 If you are planning to visit Spain, Italy or Portugal this summer and could consider staying at an Ibis hotel, you should check the rates using this offer. Offer subject to conditions and availability. Read sales conditions of the hotel upon booking. The price of $59 is per room and night, taxes included (except city taxes) and breakfast is not included. The booking period is from 06th to 31st of May 2014, for stays from 01st of June to 31st of August 2014. For Le Club Accorhotels members, the booking period is from 17th of April to5th of May 2014, for same staying periods. Bookings are subject to 100% prepayment, no modifications or cancellations allowed.